It's been a while since we last checked in on Enderal—the Skyrim total conversion from the makers of Nehrim: At Fate's Edge. Now that ModDB's annual award season has started, though, in-progress mods are rumbling to life in order to maybe tempt you into giving them a vote. Hence this trailer: a look at the game's Undercity. 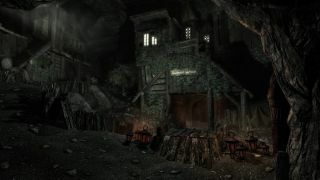 It's an atmospheric place, even if it doesn't show much beyond the environment and its inhabitants. Enderal is a sequel to Nehrim, and as such aims to create a world unrelated to TES's Tamriel with a "complex, dark storyline and thousands of secrets to discover". There's still no end to development in sight, but the mod's makers promise more video updates in the new year.